Today is the 350th anniversary of the start of the Great Fire of London. As well as some fabulous comic book stamps that have been released by the post office to commemorate the occasion, those children who are studying the event, or interested in history can now read about the fire in a wonderfully illuminating book published earlier this summer. 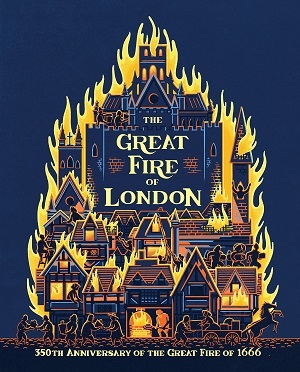 The Great Fire of London: 350th Anniversary of the Great Fire of 1666 by Emma Adams and illustrated by James Weston Lewis is a beautiful retelling of the events that took place over the few days that London was lit up by a massive conflagration from a small smouldering coal from a baker’s oven. The illustrations are striking, from the front cover onwards, as if the book itself has been set alight – the cover is rose-gold foiled – a gold orange glow that reflects the shop lighting, but it is the inside that really sets the reader alight. From the endpapers – huge magnificent flames sweeping across the page, to the cleverly illustrated interior, where the orange and yellow colour lights up the dark night sky, this book truly brings the event to life. The illustrator has ingeniously limited his palette to blues for everything that isn’t consumed by fire – the boats, the buildings, the night sky, the river – all carefully shown in silhouette almost, so that the oranges, yellows and reds of the fire glare out from the page. What’s more however, is that the fairly minimal text and huge illustrations give an enormous amount of information; telling the history of the fire as a story narrative, day by day – following in the tradition of Pepys, of course, but in simple language, explaining as the reader moves along why the houses were built so close together, why fire was used for warmth and light and so on. The amount of detail in the illustrations is fabulous too – as the reader can see the people in their houses; the expression on their faces as they see what is taking hold. It fully imagines and explains the events. There are quotes from Pepys’ diary too, as well as a summation of what happened after the fire had been put out. In William Grill style, Weston Lewis explores the changes to firefighting as a result of the fire, with a detailed drawing out of the number of firefighters, engines and fire stations that made up the first London Fire Brigade. At the end not only does the author draw attention to the monument, designed as a memorial to the fire, but also explains key people of the time, key buildings of the time, and shows a delightful map of just how much of the city the fire of London engulfed. This is the best representation and history of the Great Fire of London for children that I have seen. It makes the event dramatic and compelling, and contains all the relevant information. Buy a copy here. Check out the Museum of London’s website about the Great Fire of London here.